Wow...2 years. I am not even done with my first sentence and I can barely swallow as I choke back the tears. Happy heavenly birthday my sweet boy. What I would give right now to have you here with your brother and the rest of us celebrating. I have come to hate the saying that time heals all wounds. In my opinion, it is so untrue. It has been 2 years and my wounds have not even begun to heal. My heart feels like it did the day Cayden left me. I am an emotional wreck. I still have to try to control my emotions at all times because I never know what might make me feel apart and start crying. The thought of Cayden almost always brings tears daily. Sometimes happy tears, but mainly tears of heartache...tears of longing to have my baby here with me again. I hate that nobody gets it. Nobody understands how I feel. I still wonder how I can feel so many emotions around other twins and wonder if it will ever not be that way. I have been dreading this day for a few months now. I feel horrible for saying that since It's Carter's birthday too, but it's the truth. I feel too sad to celebrate. My poor boy, I hope someday he finds room in his heart to forgive me for saying this. It's hard to smile and be happy when I am really broken inside. Well, I wasn't going to have a party for him again this year, but after the guilt I felt not having one last year, I figured that I should at least have a small one. So, I had a few friends and their kids come over for pizza and cake and kept it really low key. Overall, it went well and I was able to get through with no tears. I saved them for later. At least I did it and don't feel like the worst mom of the year like last year. Today/ tomorrow (since it is 1am) we decided to take Carter to the New England Aquarium for his birthday. I am hoping it will be peaceful and help Anthony and Lexy too. I also think its important to say how wonderful Carter is doing. After all his hard times and struggles, he has overcome so much. He is an amazing little boy and the light of our life. He's so loving and helpful and sweet, he just melts our hearts. I know with time and each passing birthday he will understand more. I truly believe that I may have drowned in my sorrow if it wasn't for Carter. I had no choice, but to stay strong and keep putting one foot in front of the next. I had another baby to take care even if my heart had just been broken. And that's the hard part. Even when life feels like it can't go on and the pain is so strong...It does. And before you know it 2 years have gone by. I wish I could rewind the clock. I wish I could have just one more minute. But I can't. So, I will continue to go on and do everything I can to keep his memory alive. Happy 2nd birthday my love. We miss you and love you so much more than any words can ever say. When I just looked at the date of my last post...I couldn't believe it has already been a month again. My posts are definitely less and less lately. It by no means, means that I miss or love my son any less. To be honest with you...I think I needed to take a break for awhile. I was at a point where I couldn't do much at home. I was always on my blog or someone elses blog or on the anencephlay support group on facebook. I was so sad all the time. I was so scared of letting go. It has been 21 months and I have been so scared of forgetting every last inch about my sweet boy. I have been hurt by so many friends that I have decided not to have any... Why get hurt all the time when you can avoid it?? Most days I can't believe how much time has gone by. The memories seem farther and farther away...I think about dying a lot more than I ever would have before I lost him. I know most people think that's a bad thing, but if you have lost your child, I know you understand. As I sat next to her bed crying, nobody else really understood what being this close to death was doing to me. The last time was when Cayden took his last breath in my arms...it was ripping my heart out. Maybe I am trying to find an escape from the pain. I swear I am still trying to figure all of this out. Almost 2 years into this journey and most days I am not sure of a lot of things. I am so grateful for the time I was given with Cayden. He truly taught me so much and made me look at life completely different...I now know what's important. 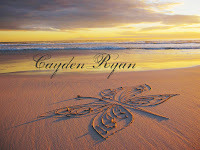 I find myself always trying to find a part of Cayden in whatever we do...as the wind and leaves blows...or the waves crash...as the rain falls...I am always trying to find a part of him...maybe another fear of losing him completely. As Carter is growing more and more...everyday is a reminder of what could have been. It's amazing how much we all love that little boy..his brother and sister are amazing with him and love him so much. He is so lucky. I wish more than anything that Cayden was here to feel their love also. I am not sure if you would consider Carter my rainbow baby because he was Cayden's twin...but I do know that he has definitely been been like our rainbow after our storm...I feel like he has kept our family together and helped us to carry on Cayden's memory...they are connected for life. Too much time has gone by since I wrote on here... I apologize. My life has been a total hectic mess for the past 2 months. There has been so many nights I have wanted to sit down and write on here, but couldn't find the energy or the words to due so. To be honest with you...I am a mess. A walking, crying, emotional mess. That pretty much sums me up these days. I had to have knee surgery this past Thursday..it has been a really tough recovery. I can't even walk at all :( I find myself feeling depressed. I think it is the fact that I have so much time to sit and think. Our dog Zayah also had surgery about 3 weeks ago and of course why not add some problems with friends into the mix too. Yup...on top of losing our son and facing everyday things, I have lost some friends too. Some friends that I have realized were never my friends to begin with. I am note sure if I am at a different stage in my grief again, but I cry at the drop of a dime and find it hard to stop. Just the thought of Cayden brings tears to my eyes and I lose it. it killed me when I realized it....I felt so much guilt. I felt like my life had gotten too busy to stop and allow my monthly writing for him. But I eventually got over it and realized that it is ok and even though I didn't write on his blog, doesn't mean that a single day went by that I wasn't thinking of my sweet boy. Before losing Cayden, I was pretty organized and stayed on top of almost everything. I was able to bring the kids to school, sports, keep the house clean, make dinner, and even other things in between all of that. But these days...I can't do any of the above. I forget everything. I Lose everything. My house is a wreck. And I am a mess. Sometimes I wonder if losing Cayden, changed me. If somewhere along the way, I lost who I was. I find it hard to believe that it has been almost 2 years since I lost my baby boy. And in that time, I have continued to be hurt by so many people. Just the other day I was told that I was lucky that I knew ahead of time to make it easier...hmmm, ok. I have also been told that since I am still posting things on facebook about Cayden, that maybe I need to get some counseling again. Here's another good one....I am lucky that Cayden died after 3 days cause I should imagine being a mother who loses her baby to SIDS at 8 months. Every time I hear things like this, I just don't understand and I don't think I ever will. I am a mom who lost her son. Nothing about that is easy, nothing could have made it easier and in the end I still long for him like every other mom that loses their child. My boy was special and amazing and meant so much to me..I will talk about him forever...until we are together again. Yesterday, I shed many tears throughout the day thinking of Cayden and all my other blm's and their babies. I lit my candle at 7pm and cried some more. I told you...I am an emotional wreck. I have been avoiding lots of people and things lately to protect my heart. I had a feeling that this was coming, but I really hoped it wouldn't. It just seemed as if everywhere I turned, I was being hurt by others words and my heart couldn't take much more. I am grieving for my baby boy that was taken from us too soon. It has only been 18 months, but for some reason, people think that is a long time and I should be "over it." But I will never be over it. I will go on and learn to live my life with my broken heart, but I will NEVER get over it. I know a girl that lives a few streets over from me. I have spoken of her in previous blog posts...she is pregnant with twins and everyone, including her likes to talk to me about her and her babies. Well, She delivered her healthy, twin baby boys yesterday. I wish I could be happy for her, but I would be lying if I said that I am. My heart was actually hurting so bad and for the first time in a long time, I asked God.. why was she able to keep her boys, but I wasn't?? Why is she a happy, proud mommy without a worry in the world, while I sit here everyday, wishing I could kiss my baby boy one more time. I ran into a friend of both of ours yesterday and she had to tell me about the girl delivering her boys and how they are all doing...I just nodded and didn't even say a word..I couldn't be fake and put on my happy face..it just wasn't possible. how can people not realize what they are saying? Last night I posted a quote on facebook that I read last week on anencephaly.info and today I received an apology email from the girl. I guess it took me posting something for her to realize what she had said, hurt me. I accepted her apology, but feel like I need a break from everyone around me. I feel like just when I am having a good day, someone pushes me back down. These people don't understand what it feels like to have your child die... A piece of you goes with them. Your life is not the same. I am wearing a pair of shoes. they are ugly shoes. uncomfortable shoes. I hate my shoes. each day I wear them and each day I wish I had another pair. some days my shoes hurt so bad that I do not think I can take another step. yet I continue to wear them. I get funny looks wearing these shoes. they are looks of sympathy. I can tell in others eyes that they are glad that they are my shoes and not theirs. they never talk about my shoes. to learn how awful my shoes are might make them uncomfortable. to truly understand these shoes, you must walk in them. but once you put them on.. you can never take them off. I now realize that I am not the only one who wears these shoes. there are many pairs in this world. some woman are like me and ache daily as they try to walk in them. some have learned how to walk in them so that they don't hurt quite so much. some have worn the shoes so long that days will go by before they think about how much they hurt. No woman deserves to wear these shoes. This really touched me when I first read it. The words just put it simply for others to understand what we are going through. I can honestly say that in these shoes, I know true happiness and sorrow... all mixed together now. These shoes have changed me so much. I can be smiling and laughing one second and crying the next. I know a whole new meaning to yearn for someone and miss them so deeply and I know a whole new meaning of "love." While wearing these painful shoes, I can still feel happiness everytime I hold Carter and hug and kiss him.. I think I have told everyone about Cayden's memorial table in our living room. It has his urn on it, fresh flowers, my favorite picture of him, a digital picture frame with all of our pictures with him, a picture of all 4 of the kids, my angel candle and my twin willow tree figures. Well, Carter is at that busy age where he gets into everything and I knew it was going to happen eventually....yesterday, he pushed a step stool up to the table and was pointing at everything yelling "Mom." I rushed over to the table and leaned down to him, I told him that it was Cayden's table and not to touch...just look. He wanted the picture of Cayden really bad so I handed it to him...well, he leaned over and kissed the picture... I couldn't believe it. It was so sweet, but so sad. He handed the picture frame back to me and sat on the step stool and watched the digital picture frame for about 2 minutes. He kept pointing and yelling, "Mom." Now, he is doing it everyday. He is so gentle and actually listens when I tell him not to touch. That is amazing to me since he is only 18 months old. I swear it is like he knows. It was also very sad and hard for me cause it is just a reminder that this is how Carter will know Cayden for the rest of his life, when what I would give anything for, would be to have them growing up together. I also took a picture of Cayden's chest. I know Holly asked me what it looks like awhile back. In the chest is everything of Cayden's and I can not go in the chest without falling apart. It sits in the living room right next to his table. I came across a poem the other day and it really rings true to how I feel sometimes, so I wanted to share it. I have a face I put in place, It's what I wear when folks are there. For those only who want to see, The way they think I ought to be. I live in times that have no light, just cloudy, darkness, endless nights. I no longer see the sun, I laugh, but never feel the fun. When I arise to start a day, I stumble as I make my way. I don't know who's really me, I'm not the one I used to be. I have no heart to fill with joy, I lost it when I lost my boy. The future is so bleak to me, I choose to not let others see. So when people stop to ask, I hide behind my smiling mask. Although, Ryan and my 3 kids that are here with me still bring me so much joy, I still feel this way a lot. I am still hurting so much inside and miss Cayden so much, but I put on my different face for everyone else so that they don't feel uncomfortable around me. I am glad that Carter is getting old enough for me to start talking to him about Cayden, but I wish my little boys were chasing each other around instead. I wish I didn't know the true depth of pain and heartache... I wish more than anything that I was sitting here tonight typing this with Cayden in my arms.. Yesterday was 18 months since I gave birth to 2 of the most amazing boys and tomorrow will be 18 months since Cayden passed away. I normally try to post a happy monthly birthday to my little angel in heaven, but I laid in bed last night feeling guilty for not doing so. I was exhausted. Carter had his 18 month checkup and shots and it was a long day. I thought of Cayden so much yesterday throughout the day. As I sat in the room at the Dr office, I wished Cayden could be there too. My heart was heavy. I thought back to the day the boys were born while I was driving and I just cried. It feels good to cry for Cayden. I miss him so much. When we lose our child that we love so much, it seems that time stands still. What moves through us is a silence, a sadness, A longing for one more day, one more word, one more touch, We may not understand why they left this earth so soon, or why they left before we were ready to say goodbye, but little by little, we begin to remember not just that they died, but that they lived. And that their life gave us memories too beautiful to forget. We will see you again someday, in Heaven, where there is no parting. A place where there are no words that mean good-bye. When I found out that Cayden had anencephaly and he would not live long, I couldn't imagine how my life would go on after losing my child. Now here I am 18 months later. I miss my little boy with everything in me, but through all of my pain and heartache, I truly feel blessed. I was chosen to carry 2 boys and it was the most amazing experience. Now, I carry one of my boys in my arms and his twin brother, I carry in my heart.